Andy Balbirnie gave Afghanistan a taste of their own medicine Tuesday, smashing a brilliant unbeaten 145 as Ireland claimed their first win of a punishing series. 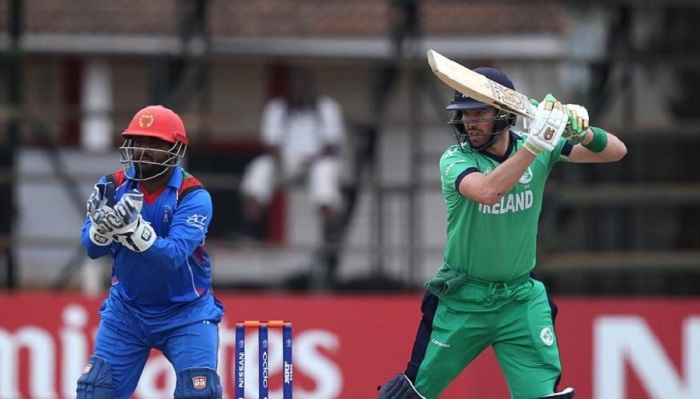 The 28-year-old Dubliner anchored Ireland's innings as they passed Afghanistan's 256-8 with an over to spare to take the third one-day international by four wickets. After Najibullah Zadran hit an unbeaten 104, Afghanistan must have thought their total was big enough to extend their unbeaten run so far in the T20 and now 50-over series. But Balbirnie hit eight sixes and eight fours to set up the morale-boosting win that levelled the five match one-day series 1-1, with two matches to play. "You dream of knocks like that," said Balbirnie. "There was a lot of pressure coming into this game. We hadn't won against these guys. There were a few scary moments but we came through. "It was an important morale-booster with two games to go." Ireland had looked shaky on 29-3 inside eight overs. But with Afghanistan's feared spin attack looking jaded, Balbirnie and George Dockrell steadied nerves and scored steady runs that put Ireland back in contention. Balbirnie scored his century off 111 balls. Dockrell then passed his 50 with a six. Two balls later, however, he was out stumped playing too ambitiously for a big shot. Stuart Poynter then lasted just three balls before he was caught trying to smash a Rashid Khan ball to the boundary. Andy McBrine then came in to play the final support role as Balbirnie hit the winning runs. Najibullah came in with Ireland taking the upper hand bowling as well with Afghanistan on 69-4. The 26-year-old all-rounder patiently took his side to safety while building his maiden international century with five sixes and five fours. Captain Asghar Afghan's 75 also played a major role as his side went from 74-5 to easily see out the 50 overs. "We dropped some important catches and we had our chances," said Asghar after. "Hopefully we can make a comeback." The series in the Indian city of Dehradun is an important preparation for Afghanistan ahead of the World Cup in June. Afghanistan ironically beat Ireland to reach the event in England. Ireland were whitewashed in the earlier T20 games in which a series of world records fell. Ireland and Afghanistan will also play a one-off Test in Dehradun.